I love when my garden starts producing. There is nothing better than making delicious, wholesome recipes from food that you have grown yourself. The next best thing is making those recipes from food that I have received as gifts from friends and family. I was lucky enough to get some wonderful cabbage from my aunt and uncle the other day. I did not grow any cabbage this year, so it was a treat! I decided to make some coleslaw and thought I would share with you my easy creamy coleslaw recipe. It is delicious! 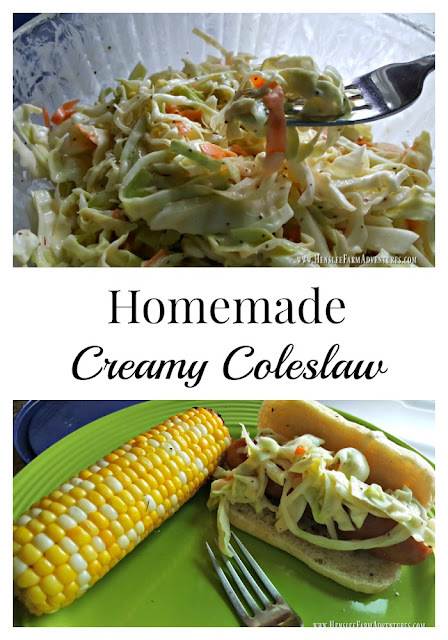 Growing up, our family had a slight disagreement on the best way to make coleslaw. It seems that when it comes down to it, there are two camps. One is that the best slaw is made with mayonnaise, and the other is that the best slaw is made with vinegar. My grandmother and mom almost always made the vinegar slaw, in fact that is the recipe that is in our family cookbook. But my sister and I both like the mayonnaise version which is the recipe that I am sharing with you today. Speaking of my sister, I remember when she was still living at home and she used to make slaw for a snack. It was one of her favorite foods. She wasn't much of a sweet eater. She always did prefer homemade pickles, tomato juice, and slaw to any cakes or pies we had. To this day, she still makes great slaw. So here is my version based on how my sister used to make it. You can see from above that the ingredients are few, and include your basic staples. Okay, I know what you are thinking, there is vinegar in that picture. Well, there is a little vinegar in this dressing, but not as much as you would put in the vinegar-based slaw. 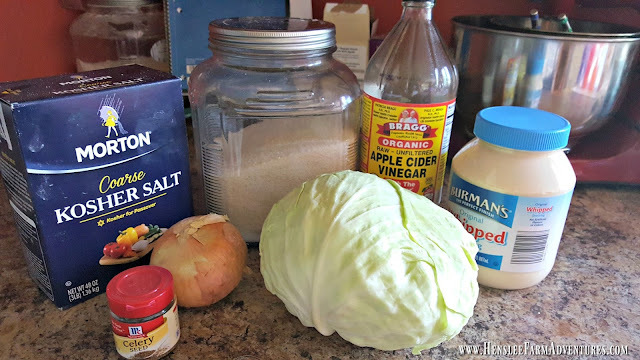 While we are on the subject of vinegar, let's have a little chat about what kind of vinegar to use for your slaw. You can see above that I used my Brag's ACV. I absolutely love the flavor and love how good it is for you. If it was any other brand of ACV, I probably wouldn't use it in this recipe. You really do want a good tasting vinegar. What also would be good in this recipe would be a white wine vinegar. It is light and tangy and great in recipes such as these. Also missing from this picture is a carrot. I like to shred a carrot up to put in my slaw. You don't have to, but if I have it on had, why not? And it seems that the dry mustard is also missing. Oh well. Coleslaw Dressing, so much better than store bought! 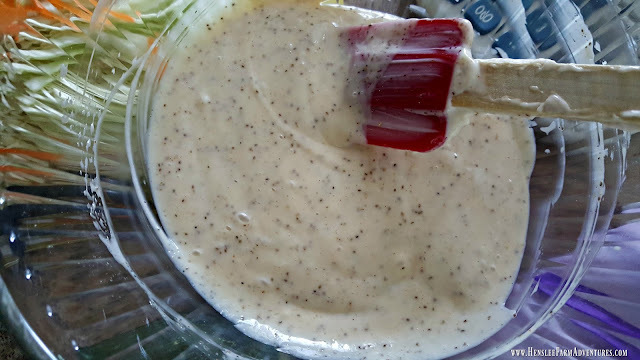 Once you mix the dressing ingredients together, put in the fridge. Next, shred your cabbage. You can do this the old-fashioned way which is what I did, or you can use a food processor. For me, if I am just cutting up one head of cabbage, it isn't worth getting my food processor out. Long shreds, this is how I like it! You can see above that I like to cut my cabbage in long pieces. I love it when it has been sitting in the dressing and you get a big fork-full and it is hanging off the fork. There is nothing better! I also like those long shreds because it stays on my sandwiches better. That's right, I love to use this slaw as a condiment! 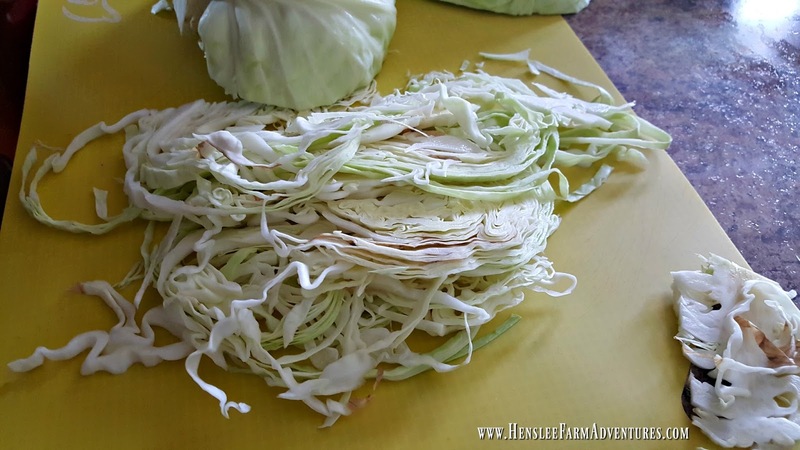 Feel free to slice or shred the cabbage the way you like it. If you are using a carrot and/or onion this is the time to shred and dice those as well and put them in with the cabbage. Next pour the dressing over the cabbage and toss so it is all coated, and put it back in the fridge to let the cabbage get a little wilted, from the dressing and soak up all the flavor. Don't worry, it will still have a little crunch to it! 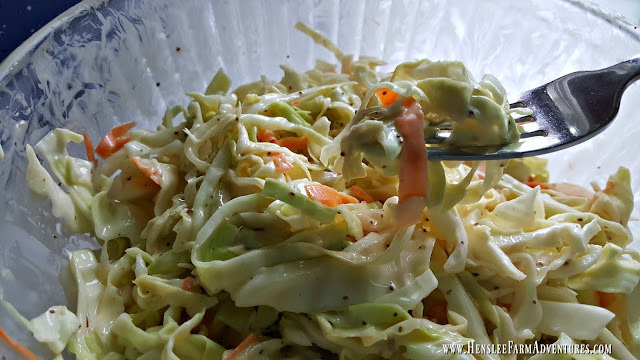 This slaw is just screaming summertime! You can see the yummy goodness. It truly is the right mix of sweet and tangy. I love to eat this as a side, and as I mentioned above, I also love to put it on my hamburgers, my BBQ pork sandwiches, and of course brats! 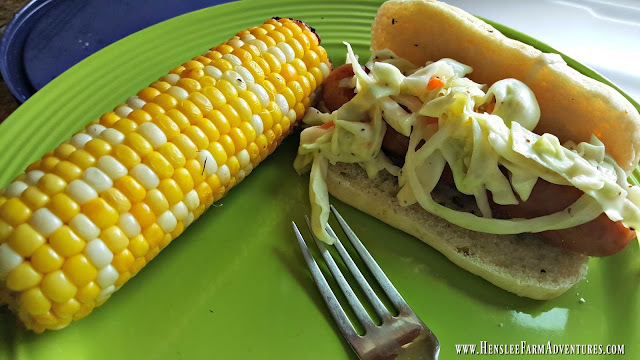 This is what I call a slaw dog, with a side of grilled corn! That's all there is to this delicious slaw recipe. Looking for a printable version of the this recipe? Click HERE. Let me know in the comments below what team you are on when it comes to slaw, Team Mayo or Team Vinegar.